Life is hectic at the moment. Been mainlining coffee and diet coke ever since finishing my run at 5.30am. The candle is being burnt at both ends and slap bang in the middle too. Having been up since 3.30am, this blog will be really brief. Well brief for me. After exactly four months and 126 blogs, I've reached a plateau where my interest in food is starting to wane a little. I honestly could take it or leave it. I nearly forgot to eat breakfast. I took an hour to scarf down a brownie this afternoon. When I got home I came close to not even bothering with a new recipe and blog. Goodness knows where today's recipe has come from. I wanted something that the husband would like (still not had feedback yet), something simple and tasty. I read so many recipes to find this one that when it came time to cook it, I couldn't remember where on earth I'd found it. Maybe on Good Food, maybe in Mary Berry, maybe in Leith's Simple Cookery. All I know was that it was categorised as quick and easy. And it was. It probably came from the Leith's book, which I was a bit disappointed with. 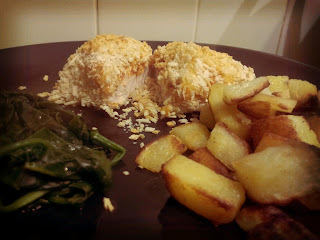 I was hoping it would be all about learning to cook from scratch, but it's just a posh version of Delia's 'How To Cheat...' That said, the rather frazzled mummy/business analyst/wife/wannabe half-marathoner in me really appreciated the quick cook, easy result of this meal. Although I did have to make saute potatoes to appease the husband for having to try something new. If I'm honest, I probably could've made this recipe up myself. In fact maybe I did. Maybe I dreamt it which is why I can't remember where I found the recipe. I hope I'm not starting to lose the plot! This would hopefully also make a really good toddler tea. We made great strides tonight with Miss A, a self-professed pasta- and fruit-only child scoffed five meatballs in tomato sauce. Progress! I can't remember when she last ate meat. Anyhow, this is how I did it. Put the flour, eggs and breadcrumbs in three separate shallow bowls. Taking one turkey breast at a time, dip first into the flour, shake to remove the excess flour; dip into the egg until completely covered and finally place in the bowl of breadcrumbs, only covering the bottom side. Put the turkey steak on a baking tray and repeat the process with the other steaks. Place a spoonful of pasta sauce on top of each piece of turkey and cover with cheese. Sprinkle the remaining breadcrumbs over the top of the turkey breasts until completely covered. Preheat the oven to 200C/180 fan/400f then bake for 30 minutes until golden brown.